But what do you do if you want a reduced voltage starting method with a transfer switch, and you have a limited mechanical room floor space? Metron solves this problem with a new MPT Fire Pump Controller series that provides various controller starting methods, and is designed with only a 32” wide dimension. This is a significant space-saver dimensionally, especially when using a Solid State Soft Start controller, with a motor size of up to 150HP (440-480 volt, 3 phase). For 200-208 voltage, the motor HP size maximum is 60HP. There are many controller manufacturers out there, and the size of the fire pump controllers with integral transfer switches vary quite substantially from 32” of width. With the smaller width does come a taller product – approximately 75” in height when mounted with legs. Typically, though, space issues in fire pump mechanical rooms have more to do with wall space than height. This product offers some great new features along with the condensed size, such as a new seven inch color screen and a through-the-door USB port to download fire pump activity data. 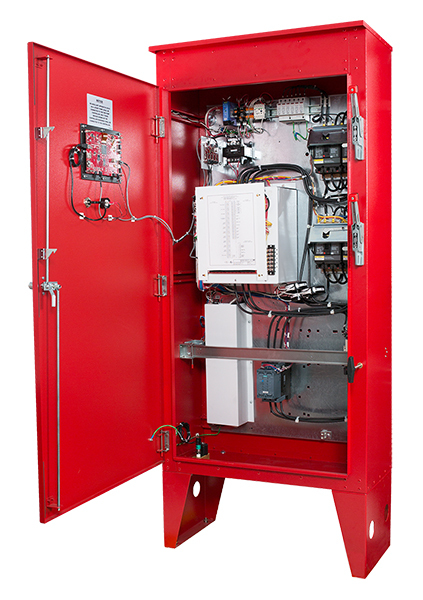 If you’d like to learn more about the new MPT Fire Pump Controller series we encourage you to give us a call today at 302-652-4722. We’re more than happy to answer any questions you may have!